A fast start, but can she maintain the pace? 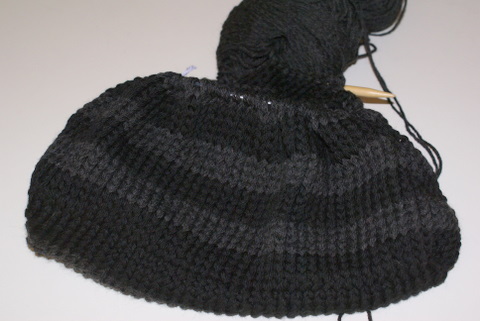 One stripe was already done, I added four more stripes plus part of another. SO really, since I needed to only get 1.25 done per day, I can now take a break for a couple of days, right? On the way up to the baseball game, Mark told me he wants me to show him how to knit, so he can have something to do while he tries to stay awake watching TV at night. He wants to make a hat. If I can teach him, and stay married, I bet I could teach anybody to knit. Hey! You taught me! If you can teach me, you can teach anybody!